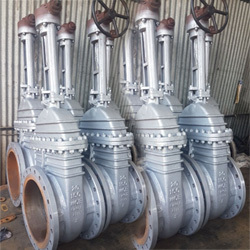 Sanco Forged Steel Valves are ideal for use in petroleum refineries, chemical plants, power generating plants and in a wide range of other industrial applications. 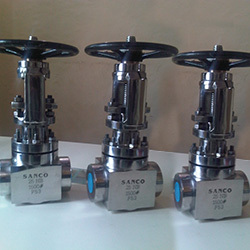 Sanco Forged Steel Valves are manufactured of superior materials for strength and durability. They incorporate the utmost in both technology and design, plus quality control procedures that ensure strict adherence to applicable industry standards. 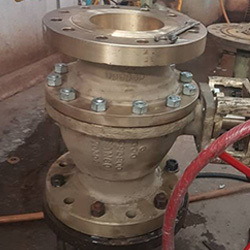 Sanco Forged Steel Valves are ideal for use in petroleum refineries, chemical plants, power generating plants and in a wide range of other industrial applications. 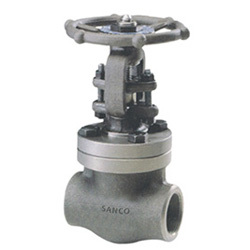 Sanco Forged Steel Valves are manufactured of superior materials for strength and durability. They incorporate the utmost in both technology and design, plus quality control procedures that ensure strict adherence to applicable industry standards. 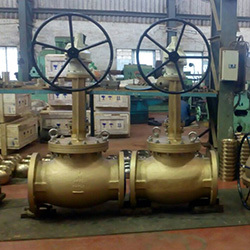 Sanco Valves offers a broad range of standard commodity forged steel gate, globe and check valves in threaded and socket weld end connections. * Valves are available in Duplex & Super Duplex Stainless Steel and Nickel Aluminium Bronze. Please indicate Trim required and ask for individual technical data sheets provided separately for these special materials. @ Wedge / Plug and Seat Rings will be overlayed with STELLITE 6 as per customer specifications.